Theatre credits: Fela/Young Musician in The Kalakutans (rehearsed reading); lead in Amidst a Sea of Flailing High Heels and Cooking Utensils (Art in Action: the Tanks, Tate Modern); vocalist for Dionne Warwick in World Hunger Day concert (Royal Albert Hall) and lead vocalist in Legends of Soul (P&O Cruises and Royal Caribbean Cruise Line). Luke appeared in the UK National Touring Production of Ghost – The Musical and most recently played Sanjar in The Apple Tree at London’s Rose and Crown Theatre. Commercials include: Bodyform Responds: the Truth; backing vocalist for Blur (BRIT Awards 2012) and Sony Office Party Mix CD. 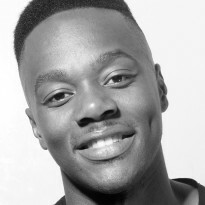 Dance and television credits include: The X Factor, The Royal Variety Show and The Jonathan Ross Show (ITV); Justin Lee Collins (Channel 5); One Direction, JLS, Take That, Wiley, Conor Maynard, Psy Oppa (‘Gangnam Style’), Beth Ditto, Kelly Rowland, La Toya Jackson and Alexandra Burke.